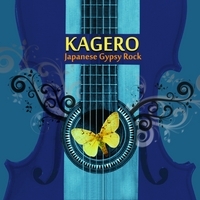 As you might surmise from their album name, Kagero are a group that does not toe the line of a particular musical tradition. More like one of the fictitious genres one of my former radio colleagues would invent when mocking sub-genres of "world music." Kagero bandleader Kaz Fujimoto celebrates this odd mashup of traditions. "Cultural confusion," he says, "is our speciality." Honestly, though, if you didn't know of the group's Japanese links, you might just hear Kagero as another of the Gypsy-flavored bands currently blooming in NYC because you won't hear much of Japan in the musical mix: English is the band's preferred tongue, acoustic strings dominate their sound, and if there's a secondary element it's Latin, not Asian. Of course, untangling the influences is futile, when one should be enjoying the delicious angst of "Grappa" or dancing to "2 + 1 Is Almost 5."